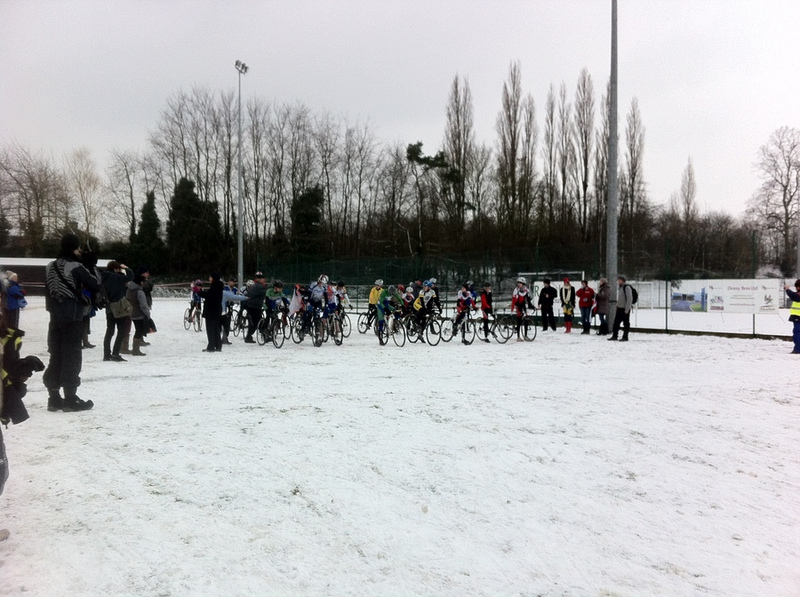 Wintry conditions greeted the organisers, marshalls, helpers and riders at the final round of the Eastern Cyclocross League. Round 14 took place at King Edward VI School in Bury St. Edmunds, skirting around the edge of playing fields and making good use of a nearby wooded section. With temperatures hovering just below freezing, and a few inches of packed snow covering the course, the traction was always going to be minimal and would be unlikely to improve much through the racing. The faster riders had a lot of fun in the difficult conditions, putting up very quick lap times and lapping most of the field (despite a much reduced line-up of 37 riders). Amazingly, everybody finished the race. Matt Webber (London Phoenix) finished a slim 14 seconds clear of Ross Tricker (XRT-Elmy Cycles), with fastest junior Sean Dunlea (Ciclos Uno) just under a minute further back. Hayden Wood finished a strong 4th despite snapping a chain. In the final league standings, I finally lost my third place to Gabor Doraghazi (Fruits 4 London) and was actually relegated to 5th by Ross Tricker despite the fact that he only rode seven races. 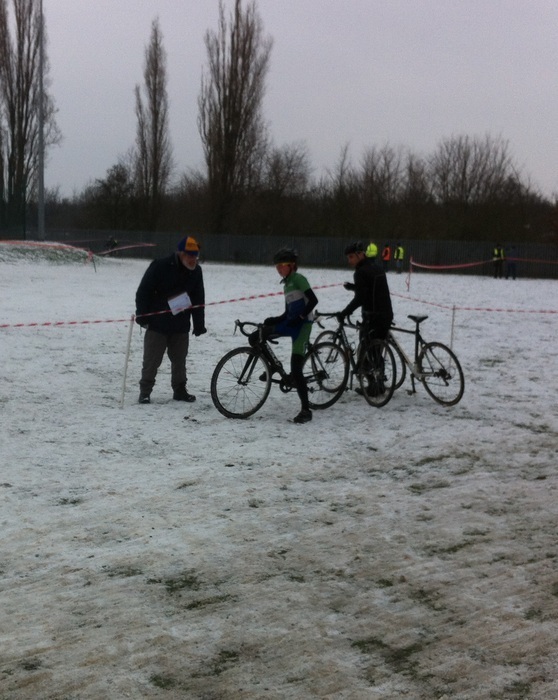 Tim Guy (Iceni Velo) just held onto first place ahead of runner-up Hayden Wood. George Baker (Kings Cliffe Flyers) held off a determined Matt Clements	(Lee Valley Youth) to finish 21 seconds ahead of his rival. Fastest under-14 was Pierce Bacon (Ipswich BC). No Great Yarmouth riders attended the event. In the league, Matt Clements (Lee Valley Youth) won the youth (under 16's) category by a comfortable margin ahead of team-mate Callum Mackie. William Hughes (Ipswich BC) was third. In the Under-14's, Dougal Toms (Iceni Velo) finished first ahead of William Raymond (Welwyn Wheelers); Pierce Bacon (Ipswich BC) was third. Sophie Holmes (Inverse RT) won the girls category. BC race report by Fergus Muir. Fergus Muir chatting to LVYCC youth rider Matt Clements.